This week on Lake Okeechobee the winds have been from the North/Northeast anywhere from 5-20mph. The water temp is 81 degrees in the afternoon and the water clarity is good all over the lake. Last week the water rose about a foot and the red water is pretty much all over the lake. It has affected the fishing on the lake. This week’s local tournament weight was down and catching bigger fish has been really tough. The best bait in the morning this week was a Spinnerbait and a Swim Bait. The fish are pretty spread out still so fish fast until you find them. After the morning bite is over I have been flipping a big 7 inch Senko with a 1/2 oz. weight, the best color is Black/Blue. Good areas to fish are Kings Bar, the Pass, Tin House and Little Grassy. 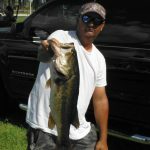 Here is a picture of Jake Whitman from Palm Beach Gardens with his big fish of the Bass Rattlers Association Tournament. You can check the water levels of Lake Okeechobee at www.okeechobeejust4bass.com.